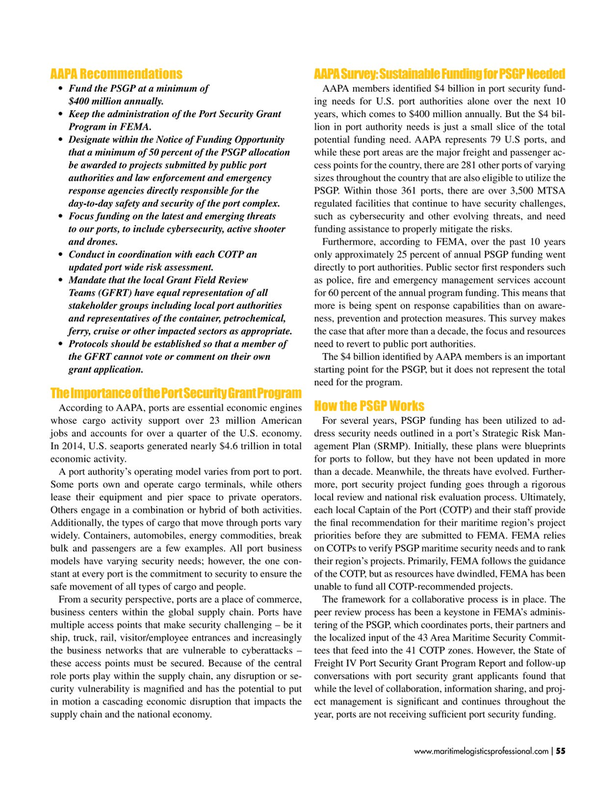 AAPA recommendations AAPA Survey: Sustainable funding for PSgP Needed •	Fund	the	PSGP	at	a	minimum	of	AAPA members identifed $4 billion in port security fund- $400	million	annually. ing needs for U.S. port authorities alone over the next 10 •	Keep	the	administration	of	the	Port	Security	Grant	years, which comes to $400 million annually. But the $4 bil- Program	in	FEMA. lion in port authority needs is just a small slice of the total •	Designate	within	the	Notice	of	Funding	Opportunity	potential funding need. AAPA represents 79 U.S ports, and that	a	minimum	of	50	percent	of	the	PSGP	allocation	while these port areas are the major freight and passenger ac- be	awarded	to	projects	submitted	by	public	port	cess points for the country, there are 281 other ports of varying authorities	and	law	enforcement	and	emergency	sizes throughout the country that are also eligible to utilize the response	agencies	directly	responsible	for	the	PSGP. Within those 361 ports, there are over 3,500 MTSA day-to-day	safety	and	security	of	the	port	complex. regulated facilities that continue to have security challenges, •	Focus	funding	on	the	latest	and	emerging	threats	such as cybersecurity and other evolving threats, and need to	our	ports,	to	include	cybersecurity,	active	shooter	funding assistance to properly mitigate the risks. and	drones. Furthermore, according to FEMA, over the past 10 years •	Conduct	in	coordination	with	each	COTP	an	only approximately 25 percent of annual PSGP funding went updated	port	wide	risk	assessment. directly to port authorities. Public sector frst responders such •	Mandate	that	the	local	Grant	Field	Review	as police, fre and emergency management services account Teams	(GFRT)	have	equal	representation	of	all	for 60 percent of the annual program funding. This means that stakeholder	groups	including	local	port	authorities	more is being spent on response capabilities than on aware- and	representatives	of	the	container,	petrochemical,	ness, prevention and protection measures. This survey makes ferry,	cruise	or	other	impacted	sectors	as	appropriate. the case that after more than a decade, the focus and resources •	Protocols	should	be	established	so	that	a	member	of	need to revert to public port authorities. the	GFRT	cannot	vote	or	comment	on	their	own	The $4 billion identifed by AAPA members is an important grant	application. starting point for the PSGP, but it does not represent the total need for the program. Additionally, the types of cargo that move through ports vary the fnal recommendation for their maritime region’s project widely. Containers, automobiles, energy commodities, break priorities before they are submitted to FEMA. FEMA relies bulk and passengers are a few examples. All port business on COTPs to verify PSGP maritime security needs and to rank models have varying security needs; however, the one con- their region’s projects. Primarily, FEMA follows the guidance stant at every port is the commitment to security to ensure the of the COTP, but as resources have dwindled, FEMA has been safe movement of all types of cargo and people. unable to fund all COTP-recommended projects. From a security perspective, ports are a place of commerce, The framework for a collaborative process is in place. The business centers within the global supply chain. Ports have peer review process has been a keystone in FEMA’s adminis- multiple access points that make security challenging – be it tering of the PSGP, which coordinates ports, their partners and ship, truck, rail, visitor/employee entrances and increasingly the localized input of the 43 Area Maritime Security Commit- the business networks that are vulnerable to cyberattacks – tees that feed into the 41 COTP zones. However, the State of these access points must be secured. Because of the central Freight IV Port Security Grant Program Report and follow-up role ports play within the supply chain, any disruption or se- conversations with port security grant applicants found that curity vulnerability is magnifed and has the potential to put while the level of collaboration, information sharing, and proj- in motion a cascading economic disruption that impacts the ect management is signifcant and continues throughout the supply chain and the national economy. year, ports are not receiving suffcient port security funding.